Moving to the next level calls for a celebration. 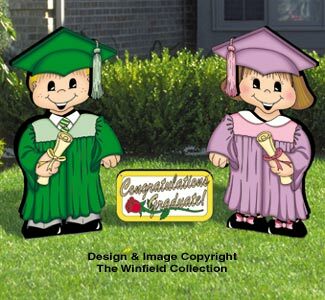 Our Darlings in Graduation Robes features a sign which may be staked in the ground or held with chain by our couple and personalized to honor your student. Chose your own School Colors for the robes to make it even more memorable. Adorable fun for our Dress-Up Darling Girl and Boy yard characters (pattern #Z-1122 sold separately). Make these Costumes out of thin plywood and "dress" your Dress-Up Darlings by attaching to them with small strips of Velcro or screws. Full-size pattern for both outfits shown. These cute kids are your Starter Patterns to use as the base on which you add the Dress-up Darlings' clothes. Paint them in swimsuits for summer fun. 2 Designs! 29"H x 16"W.